Bazooka bubble gum has been a favorite gum for over 50 years. This was one of those candies that was a favorite candy from your youth. It was very popularly known for it's red, white and blue wrappers that had a comic included. If you enjoyed this bubble gum be prepared for some changes. While attending the candy expo in Chicago I spoke with a rep from Topp's candy company. We were unable to get the classic bubble gum any longer. 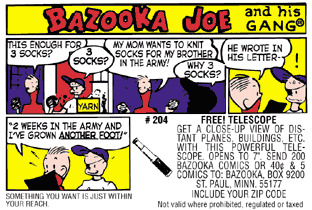 I knew there were some change involving the gum, but I was very sad to find the changes so drastic and to find out that there will no longer include the bazooka Joe comic. Soon we will see the new version of Bazooka hitting the stores. When it comes to gum there is basically two types : bubble gum and chewing gum. While adults typically favor chewing gum like Orbit, Dentyne, Trident or Style, bubble gum appeals to the kids. Kids will typically grab for a package of Bubblicious, Hubba Bubba or Bubble Tape. Kids prefer crazy flavors of sour apple, grape , strawberry or watermelon. Topps candy company says that the classic bazooka sales are down every year that while bubble gum is more a kids type of gum, the kids are picking others over bazooka. So it is time for a change that will be more appealing to the kids. Soon you will see the new gum hitting the shelves in your local super markets and stores. You may have already seen the new commercials with the brightly wrapped gum and the upbeat music that will definitely appeal to the youth of today but will that be enough ? Here are the changes that you will find when you purchase the new version. Larger pieces of bubble gum which for now will still be a rectangle. Brighter color packing and wrappers with hot colors instead of the traditional red, white and blue wrappers. A new flavor has been added, yep you will now find a Blue Raspberry included with the bazooka line up. No more comic. Nope no comic in the wrapper of the gum. Now you will find the similar waxed paper, but instead of a comic it will have games, puzzles and fun facts. Bazooka Joe Gone For Good ? Good news for Joe and his gang is they are not totally unemployed. Although the comic will no longer be included you will still find Joe, his crazy friend Mert and his dog pal included in some of the puzzles and games. dubble bubble and was somewhat soft. After about two years it was changed back to the original gum again. I hope these changes work out for Bazooka , although it will never bring back the nostalgia charm it once had.